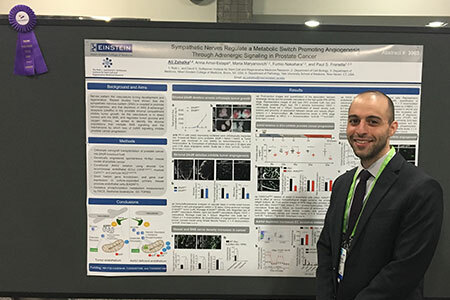 For his work investigating mechanisms connecting SNS-mediated microenvironmental effects to prostate cancer progression, Ali Zahalka was awarded Taconic Biosciences' American Association for Cancer Research (AACR) 2017 Annual Meeting Travel Award. "Our lab is interested in identifying factors that promote early-stage cancer progression," Ali told Taconic, "with the aim of developing novel therapeutic interventions." An MD/PhD candidate in the lab of Dr. Paul S. Frenette at Albert Einstein College of Medicine, Ali Zahalka presented preliminary work on these investigations at AACR 2017, which identified mechanisms through which loss of βARs may inhibit prostate cancer progression. Depleting β-adrenergic receptors (βARs) within the prostatic-stromal sympathetic nervous system (SNS) attenuates tumor growth in mouse models, suggesting a contributing role from the SNS in carcinogenesis. Previous research, spearheaded by Ali's PhD mentor, Dr. Frenette, identified an essential role for adrenergic nerves is early stage prostate cancer progression. Dr. Frenette's team found that adrenergic denervation of the prostate, or attenuating stromal βARs, inhibits cancer progression in a mouse prostate cancer model (Magnon et al., Science 2013). Building on this previous work, Ali "aimed to identify the stromal targets of adrenergic signals and the mechanisms by which loss of these signals inhibit prostate cancer progression. "Taken together, our data suggests that adrenergic nerves mediate a pro-angiogenic switch during the early stages of prostate carcinogenesis, and abrogation of β-adrenergic signaling inhibits the angio-metabolic switch and delays cancer progression." As described in his AACR 2017 abstract, Ali used an orthotopic prostate cancer xenograft model to confirm his lab's previous findings by illustrating that genetic deletion of the SNS βAR neural receptors in the microenvironment inhibited tumor growth. Further, Ali observed that tumor-growth inhibition was associated with defects in vessel branching, a phenotype also observed after chemical sympathectomy. These results suggested that altered angiogenesis due to the absence of βAR stimulation in the microenvironement contributed to tumor growth inhibition. Ali next measured prostate cancer progression in the transgenic HI-myc prostate cancer model after conditional beta-2 adrenergic receptor (Adrb2) deletion in stromal populations. "To study the contributions of vascular β-adrenergic receptor signaling in the tumor microenvironment, we utilized the Cdh5(PAC)-CreERT2 mouse to conditionally delete Adrb2 in endothelial cells." 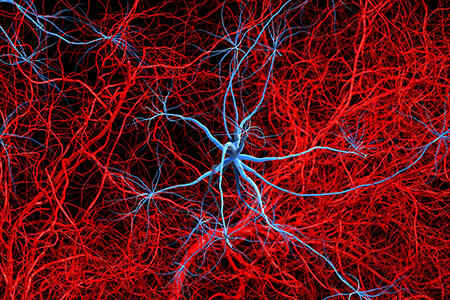 By intercrossing Adrb2-floxed mice to stromal Cre-expressing lines, including the endothelial-specific Cdh5(PAC)-CreERT2 mouse, Ali found that Conditional Adrb2 deletion in endothelial cells (ECs), but not myeloid cells or pericytes, inhibited angiogenesis and reduced disease progression throughout all histopathological cancer stages. "We showed that there was an increase in angiogenesis (an angiogenic switch), structurally patterned by adrenergic nerves, during progression from the pre-neoplastic low-grade prostatic intraepithelial neoplasia (PIN) to the cancer-committed high-grade PIN," Ali said. "Furthermore, we showed that endothelial cells are adrenergic stromal targets, and that conditional endothelial Adrb2 deletion inhibits the angiogenic switch and prostate cancer progression by increasing endothelial aerobic metabolism." Ali hopes their work will draw more investigative attention to the role nerves play in the process of pathology, especially in the tumor microenvironment. Inhibiting or abrogating adrenergic innervation of the prostate. Inhibiting β-adrenergic signaling (for example, using the well-studied and off-patent β-adrenergic antagonists). Congratulations to Ali Zahalka, MD/PhD candidate in the lab of Dr. Paul S. Frenette at Albert Einstein College of Medicine, and the recipient of Taconic's AACR 2017 Annual Meeting Travel Award.